In the heart of it all - Times Square, Planet Hollywood, Hard Rock Cafe, Radio City Music Hall, Rockefeller Center, St. Patrick's Cathedral, Fifth Avenue Shopping, Madame Tussaud's Wax Museum, Ripley's Believe It or Not!, Grand Central Station, Central Park, Carnegie Hall are all within walking distance of the apartment. Watch Broadway shows to your heart's content. This apartment is located in the Theater District. Restaurant Row (46th St) is just 1 block away, so is the Port Authority Bus Station. The 42nd St Times Square subway station has trains to take you to the Empire State Building, Macy's, Chinatown, Statue of Liberty, just to name a few. There is a large capacity A/C to keep you cool throughout the summer and central heating to keep you warm and toasty in the winter. For your entertainment, there is a 26' flat-screen HDTV, and cable tv. Bed linens, towels, kitchen towels, bathroom cleaning supplies, trash bins and trash bags, toilet paper rolls are some of the things provided. Cooking utensils, dinnerware and drink ware are also included. Free bottled water is always provided. We even have umbrellas in the clothes closet just in case it rains! Our gift shop downstairs is an extra benefit and convenience. It allows guests who check out at 11:00 am but have later flights to leave their locked luggage in the shop. Similarly, guests who arrive earlier than the check in time of 3:00 pm may do the same. The gift shop is open from 9:00 am until 11:30 pm, thereby making it easy and convenient to pick up/return apartment keys. 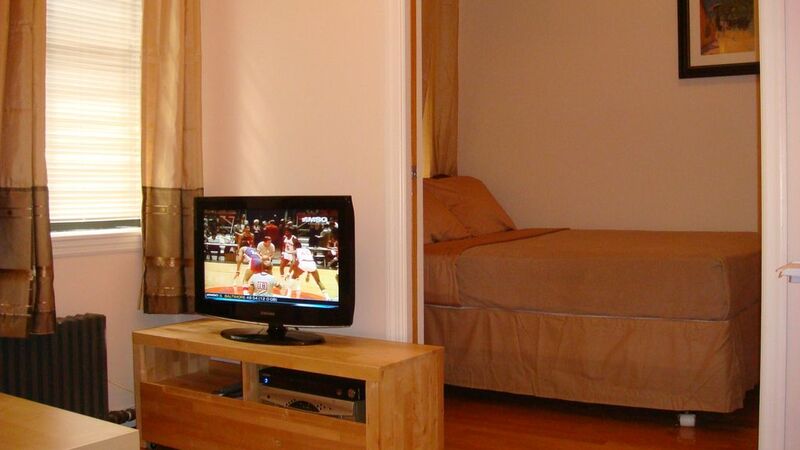 The condo is centrally located to Times Square and to the theater district, plus a number of excellent restaurants. It's also just steps away from a Subway stop and the owner responses very quickly. There is a shop on the first floor that sells all sorts of NYC hats/tshirts/postcards, etc. If you're looking for an up to date or fancy condo, this isn't it. Staying in the rear of the building unit is only slightly quieter from the busy street noise. Hopefully the condo doorknob and bathroom sink facet got fixed. As has been said, the location is perfect. Easy walking distance to all subways. Perfect for midtown theatre. This apartment has a full size refrigerator, stove, microwave, and plenty of pots and pans and glasses and plates. Well-stocked! I also appreciated the generous supply of fluffy towels! You might want to bring ear plugs, as the traffic downstairs on 8th Avenue can be loud. Also, be warned that this is a fourth floor walk-up; a bit challenging. Although the January temperature dipped to 7 degrees (Yikes!) outside, the apartment was warm and toasty. Thank you for taking the time to write this review. It is wonderful to hear such positive feedback. Your kind words about our apartment are highly appreciated. Clean, convenient, and did I mention location? forward to seeing you again! Cozy and close to the action! The apt is as advertised. Its cozy and close to the all the main attractions. There were plenty of towels and the kitchen was stocked with all the essentials. Coffee maker and filters were a great surpise. The full size fridge was nice as well for those like us who like to eat in as well. Bed was comfortable, as were the pillows. WIFI is strong and good signal. Please know it is on a main street in Midtown, so you will experience the full sounds of the streets, sirens people, traffic and garbage trucks! But if you are out and about all day walking around you will be so tired that you will just pass out! I rather enjoyed the sounds of the streets, it gives a true sense of New York. We were able to check in early and when we checked out our bags were safely stored downstairs till we were ready to leave the city. Overall a good place to stay while on New York. Thank you for taking the time to write this review. It is wonderful to hear such positive feedback. We are delighted you enjoyed your stay with us and we hope to welcome you back again soon! Apartment is as it appears in the photos. Comfortable. I will book this apartment each time I come to NYC if it is available. Capri is very responsive and a great hostess. Thank you for choosing to stay with us. It always gives us great pleasure to hear our guests are happy. We hope to welcome you again!